We welcome outstanding and talented prospective graduate students from around the nation and the world to apply for Graduate Studies. 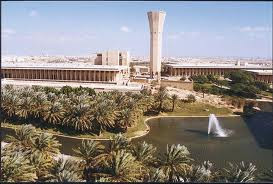 Besides national students, KFUPM currently has international graduate students from 28 different nationalities. This adds to the richness & diversity of the academic and research environment at KFUPM. The University currently offers 30 Master programs and 10 Doctoral programs in a full range of traditional disciplines, as well as interdisciplinary programs that anticipate market trends and respond to national needs. KFUPM provides full MS and PhD scholarships for distinguished graduate applicants who demonstrate high potential for conducting original research in the fields of Engineering, Sciences and Business. All graduate admissions are administered by the Deanship of Graduate Studies (DGS). Candidates who intend to enroll in graduate programs at the University need to submit an online application available on the website of DGS on the link official website. The online application is available only during the application periods according to the posted application deadlines on the link official website . The graduate admission is open twice a year for the two semesters: The Fall Term (usually starting in September) and the Spring Term (usually starting in February). After submission of the online application, mandatory documents need to be uploaded through the Upload System using the same Login ID and PIN created for the online application using this link official website. Copy of identification (National ID for Saudi nationals / Passport for international applicants / Iqama for residents of Saudi Arabia). The online application is available only during the application periods according to the posted application deadlines on the link official website. MIT: Clean Water and Clean Energy research. *Stanford University: Oil and Gas research. California Institute of Technology (Caltech): Refining and Petrochemicals research. Cambridge University: Oil and Gas research. Saudi Aramco (the largest oil company worldwide): Many research disciplines. SABIC (the 5th petrochemical company worldwide): Petrochemical research. KFUPM-MIT Collaboration Center on Clean Water and Clean Energy. National Center of Excellence on Nanotechnology. National Center of Excellence on Renewable Energy. National Center of Excellence on Refining and Petrochemicals. National Center of Excellence on Corrosion. Graduate Assistantship: Open to exceptional Saudi Graduate Assistants continuing MS degrees at KFUPM, who display outstanding performance in their Bachelor education. Research Assistantship: Open to national and international Master students, whose performance is exceptional in their Bachelor education. Lecturer: Open to exceptional Saudi Lecturers continuing Ph.D. degrees at KFUPM, who perform excellent in their Bachelor & Master education. Lecturer-B: Open to national and international exceptional Ph.D. students, whose performance is exceptional in their Bachelor & Master education. Further information, please visit official website. Demikianlah informasi Master and PhD Scholarships at King Fahd University of Petroleum and Minerals kami sampaikan, semoga bermanfaat.